Student advising is a crucial component of academic success. Students benefit from advice on course selection and sequencing, receive mentoring from advisors, and are able to identify academic issues early on and find resources to help them succeed. Each student has a faculty advisor assigned to them, Advising Assignment. Please take the opportunity to meet with your faculty advisor early and as often as needed. 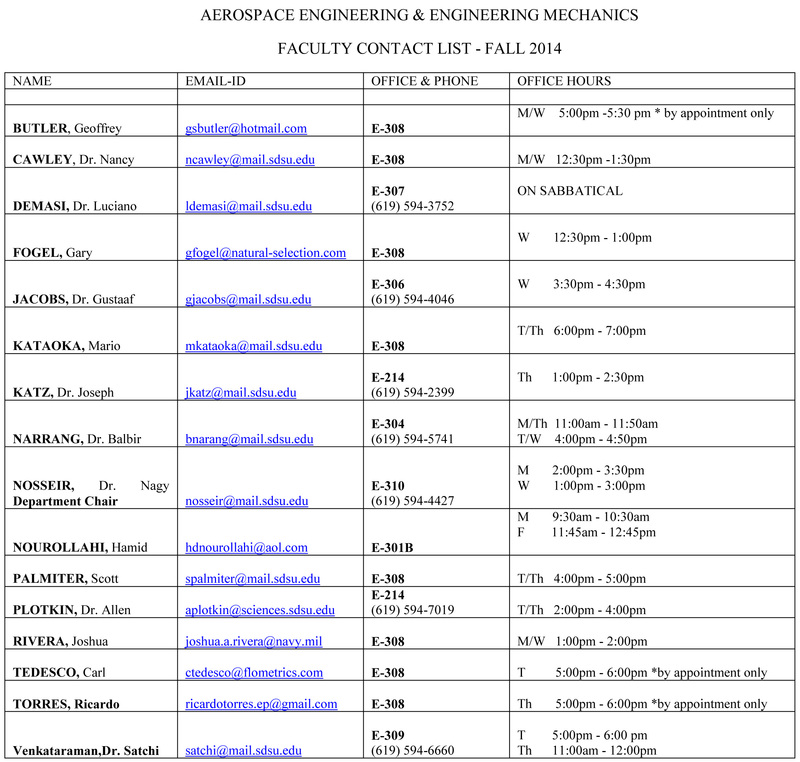 Please contact the Aerospace Engineering Department if you have any questions regarding the advising procedures. We want you to succeed in the Aerospace Engineering Program. Master Plan and Advising Record is used to facilitate advising. Please fill out the Master Plan with the courses you have taken and the courses you plan to take in the upcoming semester prior to seeing your advisor. A department curriculum guide is a resource to help you plan your schedule. Faculty advisors provide for student advising. In order to facilitate advising at key points during a student’s academic career, there are mechanisms in place to require students seek the guidance of their faculty advisors. Information on advising and student contact sheet is distributed in AE 123. AE 123 Instructor requires student to meet with faculty advisor. Students provide a contact sheet and Master Plan to the department office. Students must meet with their faculty advisor and have them initial the Master Plan. Students must meet with advisor semester prior to graduation. Graduation hold is not removed until the signed master plan is submitted to Enrollment Services by the Department Coordinator.